Our newest Featured Blog Friday post comes from our AGR consultant, Daði Rúnar Jónsson, who takes an in-depth look at the AGR dashboard. If you have any questions, comments, or would like to add the dashboard to your AGR 5 system, feel free to comment below or send us an email at sales@agrdynamics.com. The dashboard is the newest feature to be added to the AGR solution. As a supply chain consultant at AGR Dynamics, it is interesting to look into the possibilities that this new feature can offer our customers. Every company has different Key Performance Indicators (KPI’s) though their goal is always to give overall view of the performance and indicate if something needs special attention. The dashboard will therefore need some customisation in the implementation process to meet every customers’ needs. For many, this could be a good time to redefine their supply chain KPI’s as the dashboard might offer some possibilities that have not been available to them before. The key indicators in the supply chain are usually stock level, service level, supplier performance and forecast accuracy. These measurements won’t tell you everything you need to know about the performance of your supply chain – but close to it. Stock level is the current amount of product that the company has in stock. It is important to have an overview of the total stock development of the company. It is also essential to be able to drill down on locations, a specific supplier, item group or responsible purchaser to analyse if something needs special attention. This can now be done with the dynamic filter on the new dashboard. For some companies it can be useful to view stock level in different measurement (quantity, value or volume). It can also be useful to add another data series to comparison, e.g. sales, stock turn, days cover or last year stock level. Companies are always trying to minimise the stock level while maintaining a certain service level. There can, however, be very different focus between businesses when measuring the Service level. The retailer will probably focus on the stock outs in the stores, while the wholesaler has a focus on the backorders in the warehouse. The service level in the warehouse can also be measured in stock out days and some companies will not measure stock outs that last less than some days or weeks. Service level targets can also be different for items and are often associated with the ABC analysis categories. There are likewise some businesses that measure service level by order fill, line level or case fill. Order fill, measures if the order is fulfilled but can also be an aggregated measurement as the whole order is considered delayed if one line is off. Line level, is therefore more commonly used and measures each line of the order. Case fill is also often used and is based on the number of boxes within the order line fulfilled on time. Supplier performance is also commonly measured on order fill, line level or case fill. A company measuring supplier performance can easily spot delivery issues, and react to them. This overview can also be used when evaluating or negotiating with the supplier. The final indicator, Forecast accuracy, is usually measured using the mean absolute percent error. It is the average of the unsigned percentage error between the actual sales and the forecast (whether it is statistical forecast or/and manual forecast from the planner module). The new dynamic filter on the dashboard gives the user a possibility to filter the data down on e.g. items, item groups and locations. It should be noted that forecasts for groups of items tend to be more accurate than forecasts for individual items, because forecasting errors among items in a group usually have a cancelling effect. The user is also able to filter on different time periods, but filtering on specific weeks can be important, especially for companies with heavy promotional activity which is most often run on weeks. Creating a report with the AGR reporting tool is recommended to spot items with high forecast error. These reports can be used to “correct” sales data and improve future forecast accuracy. Forecast accuracy can also be improved by adding sales plans through the planner module. Key reports are displayed on the new dashboard. This makes it easy for the user to go to the reports that they either use a lot or are very important to operations. The user can choose which of their reports are displayed on the dashboard but these reports can also be edited at any time. 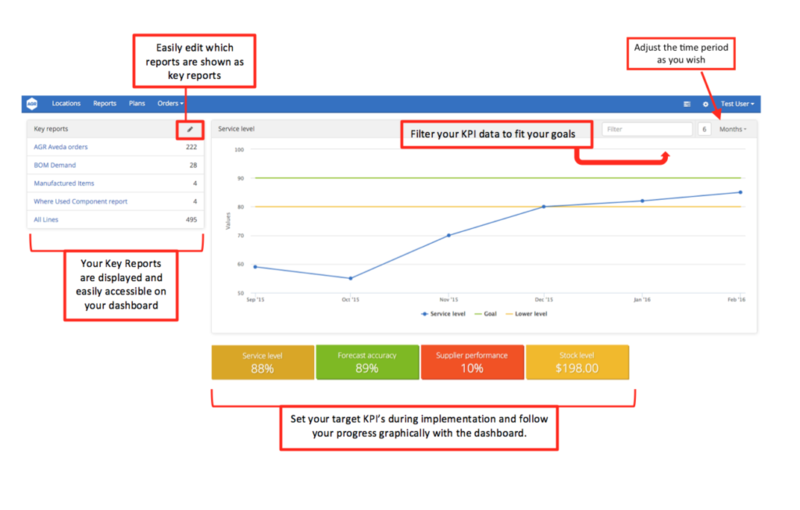 It makes sense to display reports that directly affect the KPI’s on the dashboard so the user can jump straight into the data if there is a negative development in the graphs. The user can then analyse the issue and react – whether it’s on location, supplier or item level. During implementation, target KPI’s will be input based on the company’s needs, and the dashboard will track how well the user is doing in meeting these goals. There are three different labeling colors for these targets. A green target means that the KPI goal has been met. A yellow target indicates the user/company is mid-way to reaching their set goal. A red target indicates that the user is not close to meeting the KPI target. This enables companies to easier identify where they can improve within their operations and where to focus their attention. Finally, it is important for any business to have an overview of their business and performance. The key indicators mentioned above can be used or any other data that supports the business strategy. The only condition is that the data is available in the AGR system or can be read from the ERP system. Companies may however select too many measures, leading to a lack of focus, but selecting too few may lead to missing information. Which measurements are the right one for you and your business?